My children are making memories. Of me yelling at them. It's even funnier if you've seen the meme that has only the first two lines, laid over a beautiful picture of children playing sweetly. I'm not sure where the word "meme" for these little picture jokes came from. What I love about them is that when I find one funny - because I can relate, I know I'm not the only one who has felt that way. When I laugh at a meme I'm saying, "Meme too!" But this got me thinking about memories and the idea of making them. I know my mom yelled at us kids when I was growing up, but I don't actually remember any single occurrence of it. 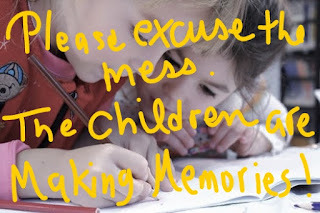 Neither do I remember any single occurrence of making a craft or playing at something that made a mess. So, what sorts of things do I remember - does anyone remember - from childhood? My memories are usually of shared fun and loving gestures. I do remember jumping from one twin bed to the other with my sister to avoid the "alligators" in the chasm between them. I do remember helping make an epic colonial settlement out of Play-Dough with my mom and sister for my sister's fifth grade project. It was then I discovered my particular talent for making tiny Play-Dough dogs and pigs. My menu of childhood memories also contains a generous portion of sibling squabbles, of course, like when my sister whacked me on the head with the telephone receiver. That was back in the days of actual dial phones, mind you, not non-lethal princess phones or the wimpy-by-weaponry-standards mobile phones of today. While some "memories" are the result of photographs I have seen so often that I believe I remember the events, the most cherished memories are those not captured on film. I remember in second grade I would eat my lunch alone (by choice) at school and felt so loved when my mom had cut my peanut butter and honey sandwich into four little pieces rather than two big ones (which was every time). Even she doesn't remember that. I have many memories of adventures with my sister, out in the hillsides and woods, exploring and often building fires to cook something over. We were not avid campers, just free ranging kids with matches. This was obviously before vanity set in. I am blessed to retain the childhood memory of a Holy Week cruising amongst the Greek Isles on what looked like a pirate ship - blood red square sails to match the blood red Easter eggs, the only color they were dyed in Greece. The fragmentary pictures held in my mind are a collage of sights, rites and culinary delights. Even today, memories of our week aboard the Panarmethes are often brought back to me in a flash by sea sickening whiff of diesel fumes. They say that olfactory sense is the most keenly tied to memory. The scent of Eucalyptus leaves always reminds me of my aunt's house. Clove cigarettes and White Linen perfume bring back images of college days - in the eighties. Sunlight warmed pine needles give off an aroma that conjures thoughts of those free ranging days when we lived in Greece. So, what memories are you making for your kids? Who knows? Probably, it's not the moments you capture in that digital database that they will never flip through as we used to flip through photo albums. Probably it's not those big events you splashed out on so they'd have a wonderful childhood to look back on. More likely it's the loving scent of your too long unwashed hair as you snuggled them to sleep so many nights, racing down up escalators at the mall with siblings, or the way you screamed in surprise and horror when you found that snake in your kitchen that one Mother's Day. Oh, wait, that was me. Kids remember the most obscure things. Of course we love them. And they're going to remember that. They're going to remember things we didn't plan, things we don't remember - and some things we hope they won't. I suppose we might worry less about making memories for them when we reflect on just what has stuck (and hasn't stuck) with us through all these years. Take a few minutes now and then to search your own mental treasury and just remember things long tucked away in your mind. And then go on and live a natural life, loving your kids - and, yes, yelling at them when necessary. She probably doesn't remember this walk on the beach, but I hope the happiness of the moment sticks with her always! I remember being a teen staying at my cousin's and having done something that I shouldn't have (or at least being a part of it) and my aunts saying "Your father is going to be really upset! Doesn't that worry you?" (they were thinking of their brother with the temper) and I said "No, not really" (I was thinking of my Dad with the temper that was far outweighed by the hugs). Great blog post...again! Why is Lent Forty Days? Impatience? I Don't Believe It Exists!